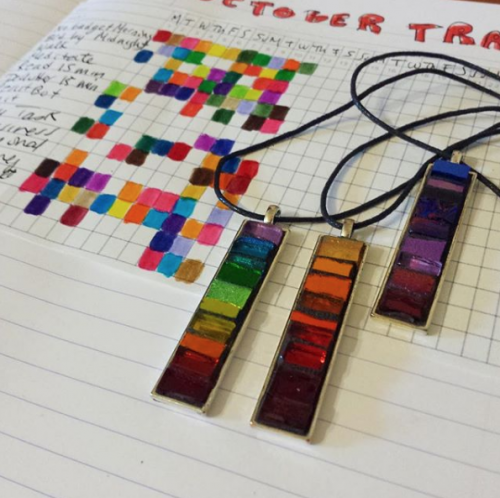 Autumn Crosses by Kaffe Fassett, constructed and quilted by Pauline Smith. James Michener Art Museum. Photo by Margaret Almon. I went on an excursion in the rain to the Michener Art Museum in Doylestown to hear a talk by Kaffe Fassett about color. 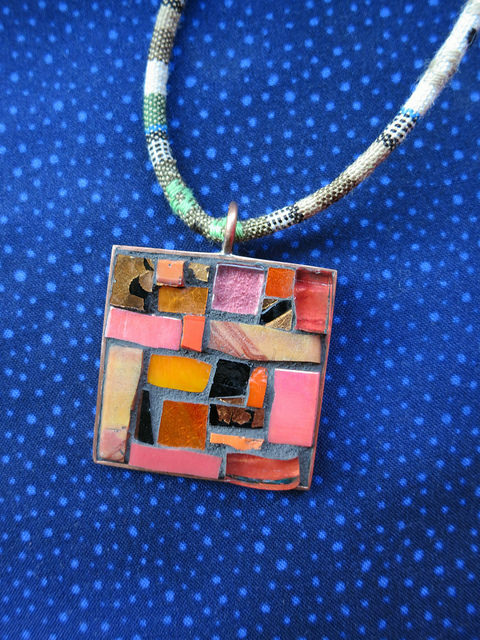 The first book I owned about mosaic was by Kaffe Fassett, and I was drawn to his use of color. 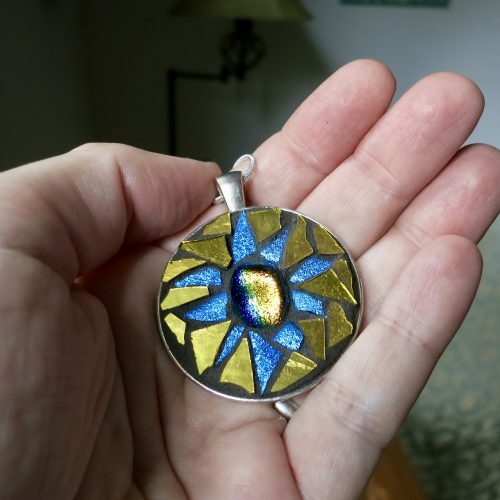 Fassett has created art in many mediums from knitting, fabric design, quilting and mosaic. Someone in the audience asked him if he had a favorite medium, and he said no, that it was all a vehicle for playing with color, that he calls his studio a color laboratory. He sees color choices as an intuitive process, trying out different combinations of fabric on flannel “audition” boards until the colors vibrate or click. Fasset’s first medium was painting and painted only in shades of white! Another audience member asked if this was his preparation for moving to color, and he said yes, it was a kind of palate cleanser. My first medium was collage, and color was my love. A friend asked if I had thought of being a painter because of my use of color, and it hadn’t occurred to me. I just wanted all the color. Looking at my photo from my previous blog post, Verve Patchwork in Orange, I recognize both a kinship with quilts and with collage, particularly the wood collage from another exhibit at the Michener, Pattern Pieces. 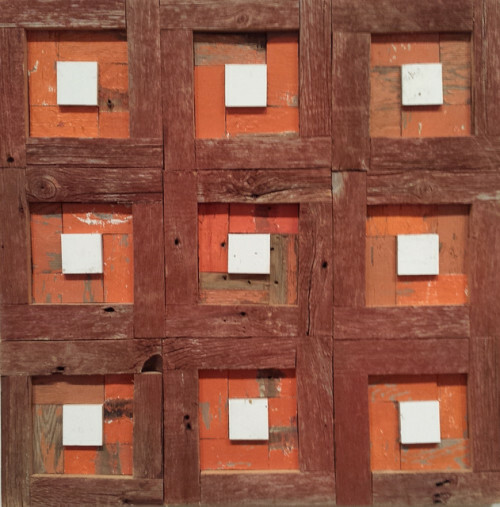 Barn Raze by Laura Petrovich-Cheney, salvaged barn wood, 30×30 inches(2012). James Michener Museum of Art. Photo by Margaret Almon. Look at this quilt-like patchwork of orange by New Jersey artist Laura Petrovich-Chaney. 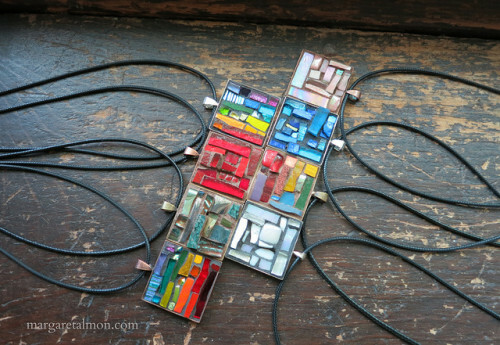 She created a series of sculptures using wood salvaged from homes after Superstorm Sandy. Watch this moving interview with Petrovich-Chaney on the Weather Channel about her project. 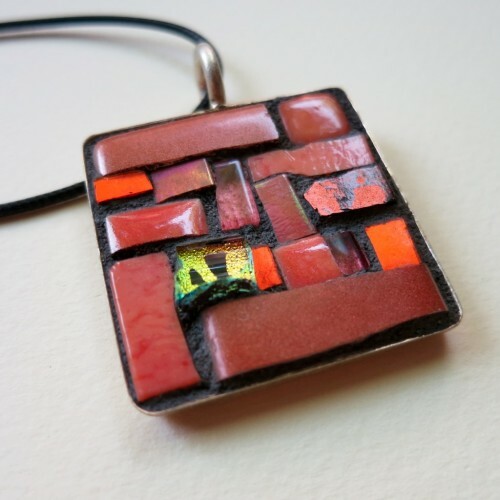 Verve Pendant in Orange and Coral by Margaret Almon, glass on copper 1.5 inches, $67. Tap photo for purchase information. For a winter infusion of color and joy, be sure to get to these exhibits. The Fassett quilts are inspired by historical quilts and are laid side by side to see the new interpretation of amazing quilts from the past. I had to detour myself around the gift shop, since there were many tempting books by Fassett as well as ribbon from collection with Brandon Mably and Kaffe Fassett Studio. I was knitting while waiting for the lecture to start and the woman next to me said she wished they were selling yarn as well. I would’ve bought yarn. November 14, 2015-February 21, 2016. 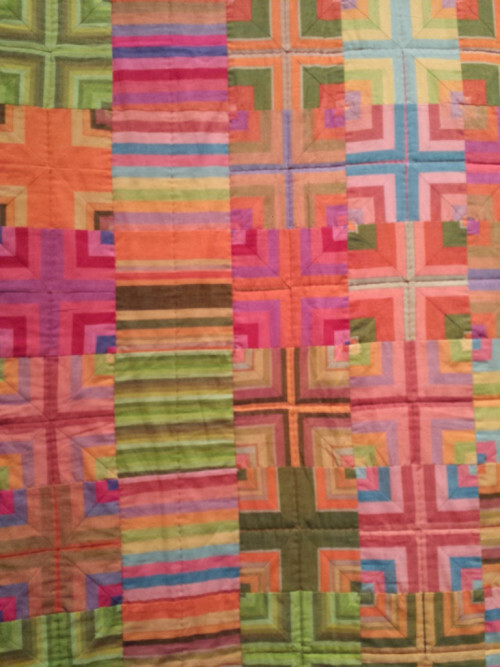 Blanket Statements: New Quilts by Kaffe Fassett and Historical Quilts from the Collection of the Quilt Museum and Gallery, York, UK, James Michener Art Museum, Doylestown, PA.
October 30, 2015-January 31, 2016. 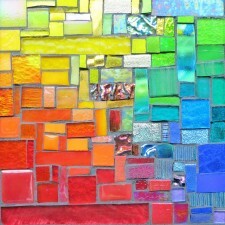 Pattern Pieces: Can You Make a Quilt Out of Wood?, James Michener Art Museum, Doylestown, PA.
Glass mosaic, 1.25 inches by Margaret Almon, $59. SOLD. 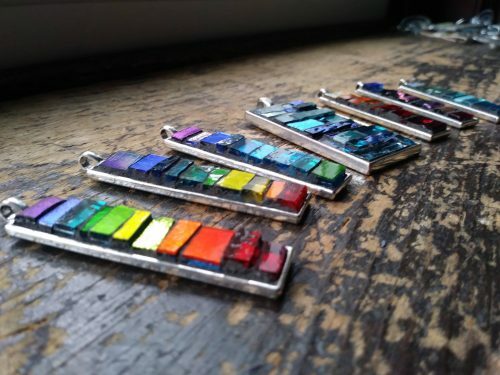 I have been experimenting with photographing my pendants on a white background to help the colors shine. I love my old windowsill, but sometimes the patterning in the wood competes with something small like a pendant. One of my favorite aspects of mosaic is that it changes with the light, and yet it makes for photographing challenges. I am always so happy that people say the work is even better in person. For the shop, I also tried out the FotoFuze app which makes the background practically a lightbox in its intensity. 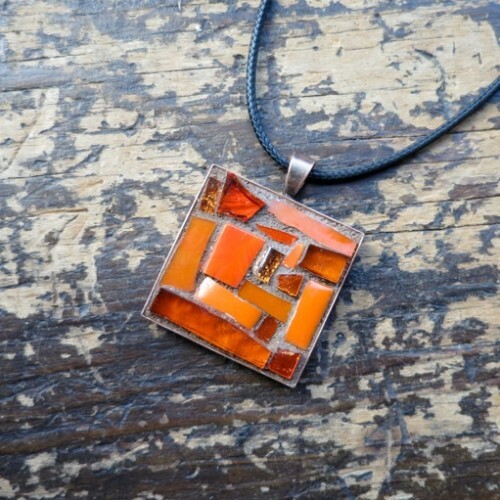 Orange Pendant by Margaret Almon. 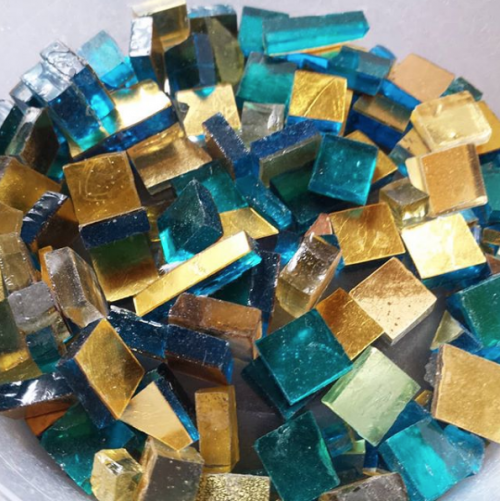 Glass, ceramic, gold smalti, 1 inch square. 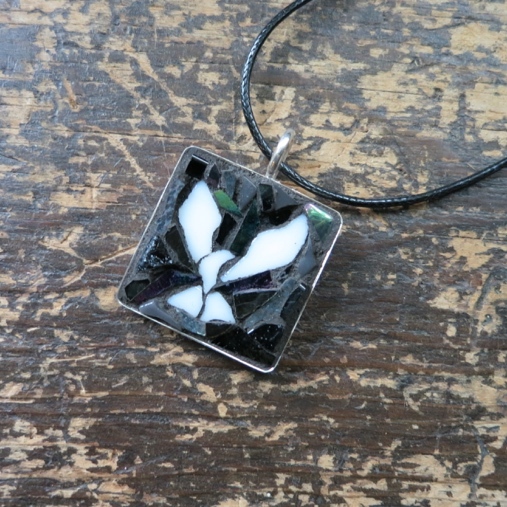 Film Noir Dove Pendant by Nutmeg Designs. Dove created by a Wayne Stratz and background mosaic by Margaret Almon.